If Facebook isn’t looking over its shoulder it certainly should. Google Plus is steadily gaining on the behemoth platform. With all the quality features it offers, G+ just may catch and surpass Facebook one day soon. Facebook currently boasts 900 million users, though that number is often called into question with the numerous fake profiles that are known to exist. Google Plus now has a membership that tops 400 million. Users are increasingly drawn to the newer platform’s cleaner interface, more user and business friendly features, and the power of its progenitor, Google itself. Though Facebook is working hard to improve its search function, it remains light years behind Google…and Google improves its search with newer, better features on a regular basis. 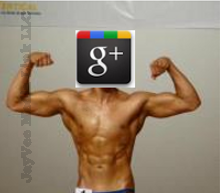 Users of Google Plus also benefit from increased visibility afforded them by the platform’s powerhouse parent. Facebook had a huge head start over Google Plus. And like G+, it constantly attempts to improve upon its good features. Yet in many important areas it often must play catch up with its younger rival. In addition to its hands-down edge in search capacities, G+ boasts a few popular features that Facebook lacks. Biggest among these is likely Google Hangouts, a live streaming group video chat that is a favorite among both personal and business users. And the newer platform is rapidly making up for its lack of any important features Facebook offers, as evidenced by its newest acquisition, sophisticated photo sharing site NIK. Is Google Plus exciting YOU? How are you using its features to help your business? Please leave your thoughts in the comments section below! This entry was posted in Social Media Management/Marketing and tagged Facebook, Google, Google Plus, Jeanine, Social Media Management/Marketing, Vecchiarelli by Jeanine Vecchiarelli. Bookmark the permalink.